By an overwhelming margin, Puerto Ricans Vote for Statehood. But the vote is nonbinding, and only 23% bothered to vote. According to early results on a government website, statehood drew 97% of support with more than 90% of votes counted Sunday afternoon, but less than one in four voters participated in the plebiscite as opponents called for a boycott. Polls closed at 3 p.m. Sunday. 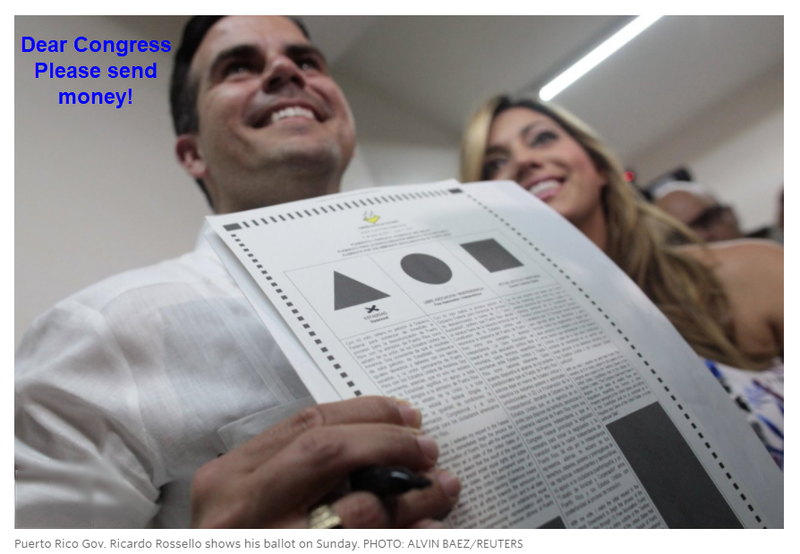 The vote was spearheaded by the territory’s governor, Ricardo Rosselló, who has pushed for statehood as a way to help improve the island’s economy, which is weighed down by debts of more than $73 billion. In May, Mr. Rosselló declared what amounts to the largest-ever municipal bankruptcy in the U.S. that placed Puerto Rico under court protection. Congress would need to authorize a new state. Mr. Rosselló recently signed into law a measure creating a commission to press U.S. lawmakers for admission. On Sunday evening, he said he would visit Washington, D.C. to formally notify Congress and the White House of the results. “From today going forward, the federal government will no longer be able to ignore the voice of the majority of the American citizens in Puerto Rico,” Mr. Rosselló said. Puerto Rico is looking for a handout and Republicans would be crazy to give them one. Do the Republicans want or need two more Democratic senators? This was a political stunt and a waste of money Puerto Rico does not have. Puerto Ricans have American Passports. So funny of a response. More slackers, exactly what we need. Who do you think the 23% of voters were, those on public assistance. Post-bankruptcy, with hedge funds holding worthless muni debt bought for pennies on the dollar, the island has a fresh start. Ballot measures of this type depend upon the phrasing. If it was worded: Do you wish to lose PR’s competitive advantage in attracting employers (statehood) and forever forgo industrial jobs, the vote would be to stay a tax-free island haven. Ditto, do you want to pay the USA tribute/federal income tax (statehood) and have LGBT bathrooms and other PC nonsense. Statehood is just a ruse for hedge funds to cash in big on Puerto Rico debt gobbled up on the cheap. Yep! If becoming a US State would pay all your debt and put your on the Welfare Rolls for the rest of your life….I’d guess about 3/4 of all the countries in the world would like to become a US State.. Listening to statehood supporters in Puerto Rico, vociferously defending in Spanish an idealized version of admission to the union that seems firmly rooted in fantasy, whereby they purport to sell a type of socialist-redistributionist-of-wealth economic system. It sounds like for them statehood means that we will get a part of the revenues of oil production in Texas, part of the proceeds from the entertainment industry in Hollywood, the economic bonanza from Wall Street, as well as dollars from Orlando’s tourism sector. They describe statehood in a series of numbers: the billions of dollars that we will allegedly get from uncle Sam. You’ve got all these retirees that are owed pensions. The governor’s said they’re going to get at least a 10 percent cut, at least some of them will. You’ve got other creditors. They’ve just closed 180 public schools on the island, which left parents and students very upset. There’s a half – there’s $500 million in cuts proposed for the university here, and there’s a student strike. tell people they are going to get a haircut/scare them, and they will vote for any alternative. Even then, the turnout was exceedingly low. Need to look behind the scenes at the money behind this non-binding plebiscite, which of course the mainstream media will never do. If you followed the money trail, it is likely hedge funds based in NYC and contributing to DNC, Hillary, Clinton Foundation, Schumer, et al. are behind PR election spending. Win-win for hedge funds (get paid off on worthless debt) and DNC (get control of USA Senate). Would have been a slam dunk with a few bribes, contributions or $400,000 speeches with Crooked Hillary in office. Pockets have been like that for years already in Cornforny. “A Riverside County school district is investigating a series of social media posts made by teachers Thursday saying the absence of students participating in the nationwide A Day Without Immigrants strike created a more productive classroom environment”. (This would be my “xenophobia flaw” according to Gov. Moonbeam, but it doesn’t take much to realize that it’s a mucho problema). Going through Miami airport is like being in a Spanish speaking country. So many hot little latinas though, so it’s a plus. As soon as the Dems have the congress again, PR will become a state. The current democratic party will never be in power again. They blew it. I am not saying a heavily reformed Dem party won’t gain power some day — just saying this current group of corrupt, free loading dumb @ssses have in TV parlance jumped the shark. While Bernie Sanders is collecting $1 million in book royalties and his supporters are installing censorship programs and racism on college campuses — the socialist paradise of Venezuela is still waiting for Bernie’s arrival. Only idiots voted for Bernie, and only criminals voted for Hilary. This current democrat party is dead. The dems controlled everything after the 2008 elections and didn’t make PR a state. If they were to say not voting = keep status quo, > 75% say leave the idea alone. Changing to US Statehood is just another way for those in charge to kick the can and distract from their impotence, lack of ideas and fear of facing the necessary changes. Same lack of impotence, ideas and fear of necessary changes coming to a geography near you soon. UK comes to mind as example. They get to take all their debts. PR would be better off independent. As would every state, aside from perhaps the very geographically smallest ones. Better off referring to by far most residents. As opposed to the so called “representatives” that, according to well indoctrinated progressive superstition, “speak for” them. Along with a small band of fellow travelling sycophants enriched and empowered by the current structure of systemic theft and enslavement. They have two states already … why do they need a third? Sure, bring another welfare state into the union. We need that about as much as a poke in the eye with a sharp stick. Any politician who promotes it should be booted from office. No more freeloaders! The gravy train is already full!!!! So, a US Government-privileged usury cartel is allowed to drive US citizens and their local governments into debt but the responsible party/monetary sovereign, i.e. the US Federal Government is to do nothing?! Not that Puerto Rico alone deserves restitution; the entire US could also use a Steve-Keen-like “A modern Jubilee” as well as fundamental reform wrt fiat and private credit creation to prevent or at least delay the recurrence of this problem. Government services are not a “right”, and yes they do cost money. Its shocking that you liberals don’t grasp this obvious fact. You really do think money grows on trees!! Big Business is the biggest freeloaders, not the poor. Systemically, by far the biggest freeloaders are asset owners. With real estate owners by far topping all charts of unearned rent seeking. The Fed’s, and government’s (at all levels) entire charter, is to take fruits of labor earned by those doing something productive, away from them. And handing it to idle “asset owners.” The latter Newspeak for the well connected and wealthy. Second to that, comes freeloading via the parasitic legal system. The whole notion that you can be sued for “violating” a contract you never explicitly signed, but are instead indeed oftyen barred from signing, without first having been convicted of doing something wrong (which takes a criminal conviction), is nothing but welfare for a sea of unproductive, regulation riding leeches. In the process blowing away all and every protection against arbitrary shakedown that an impartial court system was supposed to provide. A huge part of the wealth extraction/theft committed by the FIRE complex, is enabled directly by this usurpation. And then there is pension and health care rackets. Whereby a bunch of yahoos dumb enough to have handed over their could-have-been-savings to conmen, now run around like bucktoothed stooges, cheering on Massa Gommiment to rob other peoples children, to reward them for being pliant and dumb enough to be conned. Following these rackets from far behind, there is massive freeloading associated with credentialism: Limits on who can practice medicine, law, carry weapons, sell real estate blah, blah. Again, shielding those in those rackets from competition. And then, still as big as ever, but by now bypassed many fold by the above, are our old friends the Military Industrial Complex, traditional welfare recipients, and public unions. Of course the latter are the only ones that are popularly debated. As the whole point of “debates” in progressive dystopias, is to show ones Facebook friends that one is edumecated enough to have read a book or two by some anointed mid century saint with a pen. Whether that be Ayn Rand or some French socialist. And back then MILINDU, unions and traditional welfare, were still the biggies. But by now, while still hugely problematic, they are, relative to rest of the above, largely irrelevant footnotes. The money that government purports to spend on the poor mostly goes toward government bureaucrats — that’s just plain fraud. Since LBJ started his war on poverty, there are more government agencies focused on the poor (with headcount to boot). The budgets are bigger. The buildings housing the welfare offices are huge and were air conditioned before most private companies. And for all that expenditure on government bureaucrats? There are more people on food stamps then ever before. The poor are freeloaders — its just that public employees then freeload off the poor. Government subsidies* for private credit creation are welfare for the richer, the more so-called credit worthy, at the expense of the poorer, the less so-called credit worthy. Let’s have more concern about welfare for the rich then, since, for example, a poor man has never automated jobs away with the workers’ own legally stolen purchasing power. *Including positive yields on sovereign (hence risk-free**) debt and positive interest on reserves (IOR), also risk-free. ** At least nominally but the richer have no more right to be protected from price inflation than the poorer. 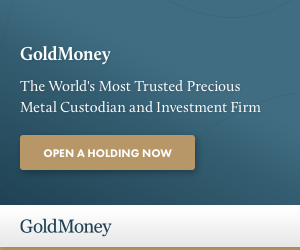 What part of eliminating privileges for depository institutions and equal fiat distributions to all US citizens (as restitution) requires bigger government? Jerry Brown calls the ones who financially sustain the parasites “freeloaders”. Puerto Rico is a colony with no political representation. It does not even have the right to default on its debt. The US should either offer Puerto Rico statehood or independence. I also vote to have other people pay my bills for me while I sit around and complain!!! Puerto Rico is the US version of Greece. Give them their own currency and let them 1) devalue and 2) allow the domestic economy to own itself. Meanwhile, Obama’s little poster child for government “green” subsidies — Tesla welfare systems — saw its sales in Denmark implode by 60%…. The reason (DUH!! ), Denmark stopped giving taxpayer subsidies and told Tesla to compete on its own (lack of) merits. Forget about sales growth. Tesla can’t make sales without massive subsidies. They can’t build factories without massive subsidies. And they (so far) avoided recalls for defective parts — which they would have to do as a matter of law if Tesla was a real car company. Not too long ago, it was pointed out that Musk was juggling funds between 3 conpanies, Tesla, Solar City, and Space X. I think he has 7 companies now, all chasing projects that need extensive developement to succeed on their own. First off, the arrangement hasn’t worked well for PR and nobody is satisfied with the status quo. There was a small turnout because PRs know the drill about advisory votes, not worth the trip to the polls. While independence might be emotionally satisfying I think most PRs realize it would make their economic situation worse. PR should have taken off economically when Castro took over Cuba but all the economic benefit went north to Florida. PR should be blanketed with upscale US retirement communities but it never happened, crime and resentment towards mainlanders are sea anchors for this opportunity. Ironically the US went to war with Spain hoping to gain Cuba but ended up with the rest of the Spanish empire, PR,Guam and the Philippines for 25 years. It’s really time to cut PR loose completely. Nothing there for us and probably better for them. but but Puerto Rico has some decent surf spots. Puerto Ricans remind me of Lower Slobovians and Venezuelans. They were spray paint champions of the 50’s in New York neighbohoods. Problem was, tou can’t sign a check with spray paint. B: What will you have though to keep clean? Of course, the birth rate on the West Side must have been very low because according to what I’ve read, only two of the guys in the Jets and Sharks were heterosexual. However, as one comedian said, you know it was fiction because when Tony yelled “Maria!” only one girl came to the window. The flag manufacturers are getting really excited. Just think of all the jobs it will create. Who cares what they voted? It is meaningless. 77% of the population voted to leave well enough alone. Majority rules. Do the American people get to decide whether we want Puerto Rico as our 51st State? Or will that decision get shoved down our throats as well? No nation ever became prosperous by importing poverty and ignorance. Molyneux nailed it with the facts. The mainstream news or your local elected representatives would NEVER expose these truths to you. In fact watch them endorse statehood for Puerto Rico by telling you it would be a win-win for the Puerto Ricans and America. More Deep State playbook stuff to turn us Third World. It’s coming.